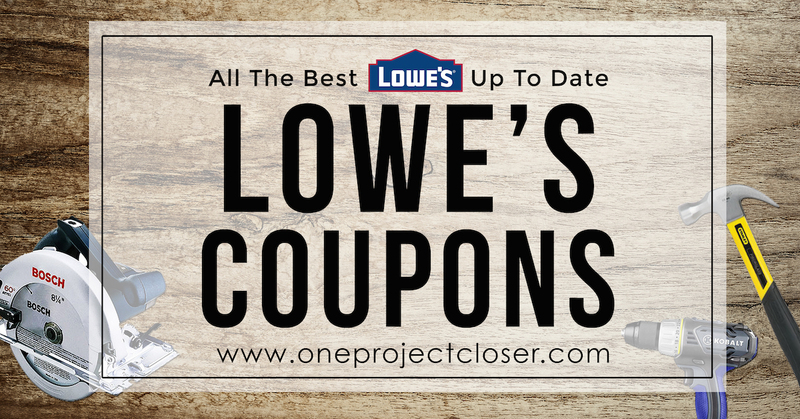 One Project Closer is not affiliated with Lowe’s, but we find ourselves shopping there quite often! If you’re a do-it-yourselfer like us, then saving money is important to you. Here are a few ways YOU can save at Lowe’s. Visit Lowe’s’ savings page for current deals, sorted by department. You can frequently find 10% off or more on appliances, deep discounts on particular tool brands, and sales on everything from painting supplies to construction materials. 1. Lowe’s Card Holders: Lowes’ Discount Page will email you a free online printable coupon (and mail you a copy) for 10% off any in-store purchase (up to $2000.00 maximum discount). This is the standard 10% off coupon you see advertised in most places, and the easiest one to get online. Note that some other sites have recently cropped up on the web that are downloading a picture of the coupon from this site and allowing you to “re-print” it from their site. If you look carefully at the image, you will notice is has a unique bar code. The store computers record this bar code at the first use and invalidate it for future use. (If they didn’t do this, you could just photocopy it over and over again. That’s not what Lowe’s intended when they offered the deal). 2. Military Discounts: Lowe’s has a policy to give United States Armed Service Members 10% off all year long. You need a military ID at the time of check out and you cannot use the self service lanes. Obviously, this is a great way to honor our servicemen and women and we are excited to see Lowe’s take this step. Based on information available online, this discount cannot be used in conjunction with other discounts, such as the moving coupon deal. E-Bay: You can sometimes find 10% off coupons for Lowe’s for sale on E-bay and other auction sites. This is more of a hassle, and again, unless it is an individual seller, the source of the coupons may be dubious. You need to be especially careful of coupons that appear to be photocopied, will be delivered via email, or have a single use bar code on them. It is very possible that these coupons are being sold to multiple people and that they will not actually work when you get into the store. Lowe’s has a superb return policy! They allow you to return most items purchased on Lowes.com at your local store within 90 days. Some categories have restrictions, though. For example, major appliances only get seven days (and then you have to use the appliance’s warranty), and outdoor power equipment gets 30 days. For more information, visit the web site and look up the return policy details before making your purchase.